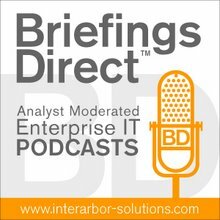 Welcome to a podcast discussion on Green IT and the many ways to help reduce energy use, stem carbon dioxide creation, and reduce total IT costs -- all at the same time. We're also focusing on how IT can be a benefit to a whole business or corporate-level look at energy use. We'll look at how current IT planners should view energy concerns, some common approaches to help conserve energy, and at how IT suppliers themselves can make "green" a priority in their new systems and solutions. Here to help us better understand the Green IT issues, technologies, and practices impacting today's enterprise IT installations and the larger businesses they support, we're joined by five executives from HP: Christine Reischl, general manager of HP's Industry Standard Servers; Paul Miller, vice president of Enterprise Servers and Storage Marketing at HP; Michelle Weiss, vice president of marketing for HP's Technology Services; Jeff Wacker, an EDS Fellow, and Doug Oathout, vice president of Green IT for HP's Enterprise Servers and Storage. The panel was moderated be me, Dana Gardner, principal analyst at Interarbor Solutions. Oathout: The current cost of energy continues to rise. The amount of energy used by IT is not going down. So, it's becoming a larger portion of their budget. ... [Executives] want to look at energy use and how they can reduce it, not only from a data center perspective, but also from consumption of the monitors, printers, and desktop PCs as well. So, the first major concern is the cost of energy to run IT. [They also] want to extend the life of their data center. They don't want to have to spend $10 million, $50 million, or $100 million to build another data center in this economic environment. So, they want to know anything possible, from best practices to new equipment to new cooling designs, to help them extend the life of the data center. Lastly, they're concerned with regulations coming in the marketplace. A number of countries already have a demand to reduce power consumption through most of their major companies. We have a European Code of Conduct, that's optional for data centers, and then the U.S. has regulations now in front of Congress to start a cap-and-trade system. IT can multiply the effects of intelligence being built into the system. IT is the backbone of digitization of information, which allows smart business people to make good, sound decisions. ... This is a must-do. The business environment is saying, "You've got to reduce cost," and then the government is going to come in and say, "You're going to have to reduce your energy." So, this is a must-do. Miller: One of the key issues is who owns the problem of energy within the business and within the data center. IT clearly has a role. The CFO has a role. The data center facilities manager has a role. ... You can't manage what you can't see. There are very limited tools today to understand where energy is being used, how efficient systems are, and how making changes in your data center can help the end customer. Our expertise in knowing where and how changes to different equipment, different software models, and different service models can drive a significant impact to the amount of energy that customers are using and also help them grow their capacity at the same time. ... Everyone needs an ROI that's as quick as possible. It's gone from 12 months down to 6 months. With our new ProLiant G6 servers, the cost and energy savings alone is so significant, when you tie in technologies like virtualization and the power and performance we have, we're seeing up to three months ROI over older servers by companies being able to save on energy plus software costs. Reischl: Well, we have been investing in that area for several years now. We will have an energy power cooling roadmap and we will continuously launch innovation as we go a long. We also have an overall environment around power and cooling, which we call the Thermal Logic environment. Under this umbrella, we are not only innovating on the hardware side, but on the software side as well, to ensure that we can benefit on both sides for our customers. In addition to that, HP ProCurve, for example, has switches that now use 40 percent less energy than industry average network switches. We also have our StorageWorks Enterprise Virtual Array, which reduces the cost of power and cooling by 50 percent using thin provisioning and larger capacity disks. Weiss: IT tends to think in terms of a lifecycle. If you think about ITIL and all of the processes and procedures most IT people follow, they tend to be more process oriented than most groups. But, there is even more understanding now about that latter stage of the lifecycle and not just in terms of disposing of equipment. The other area that people are really thinking about now is data -- what do you do at the end of the lifecycle of data? How do you keep the data around that you need to, and what do you do about data that you need to archive and maybe put on less energy-consuming devices? That's a very big area. Wacker: [At EDS] we look for total solutions, as opposed to spot solutions, as we approach the entire ecology, energy, and efficiency triumvirate. It's all three of those things in one. It's not just energy. It's all three. We look from the origination all the way through the delivery of the data in a business process. Not only do we do the data centers, and run servers, storage, and communications, but we also run applications. Applications are also high on the order of whether they are green or not. First of all, it means reconciling an application's portfolio, so that you're not running three applications in three different places. That will run three different server platforms and therefore will require more energy. It's being able to understand the inefficiencies with which we've coded much of our application services in the past, and understanding that there are much more efficient ways to use the emerging technologies and the emerging servers than we've ever used before. So, we have a very high focus on building green applications and reconciling existing portfolios of applications into green portfolios. Moving onto the business processes, the best data delivered into the worst process will not improve that process at all. It will just have extended it. Business process outsourcing, business process consulting, and understanding how you use IT in the business is continuing to have a very large impact on environmental and green. You've already identified the major culprit in this. That is that the cost of energy is going to continue to accelerate, and to be higher and higher, and therefore a major component of your cost structure in running IT. So everybody is looking at that. Cloud is, by its definition, moving a lot of processes into a very few number of boxes -- ultra virtualization, ultra flexibility. So it's a two-sided sword and both sides have to be looked at. One, is for you to be able to get the benefits of the cloud, but the other one is to make sure that the cost of the cloud, both in terms of capabilities as well as the environment, are in your mindset as you contract. One of the things about what has been called cloud or Adaptive Infrastructure is that you've got to look at it from two sides. One, if you know where you're getting your IT from, you can ask that supplier how green is your IT, and hold that supplier to a high standard of green IT.